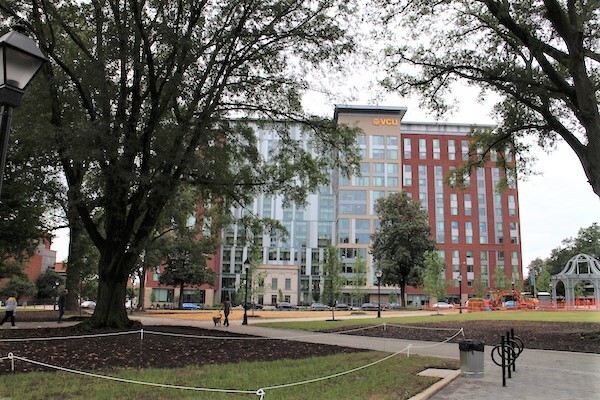 Two major landmarks at VCU’s Monroe Park campus made their debuts last week. The newly built Gladding Residence Center and the revamped Monroe Park were unveiled to the public on Thursday near the intersection of West Main and South Laurel streets. 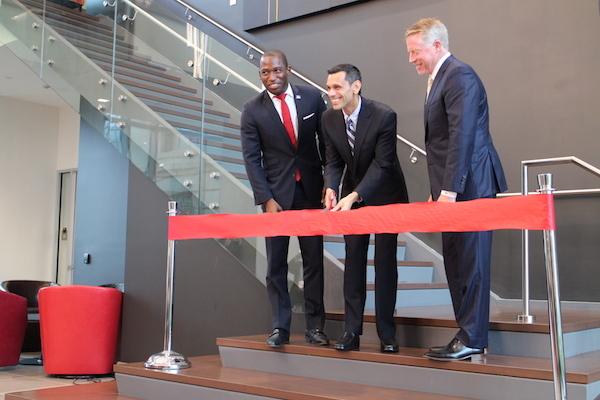 VCU held a ribbon cutting for the GRC, a $96 million, 12-story building that rose at 711 W. Main St. on the site of a previous iteration of the dorms that were demolished in 2016. VCU President Michael Rao was joined by Mayor Levar Stoney and City Council President Chris Hilbert at Thursday’s event. Also on hand were members of the family of Jane Bell Gladding, a former school dean for whom the dorm is named. VCU’s new dorm looks out over Monroe Park. 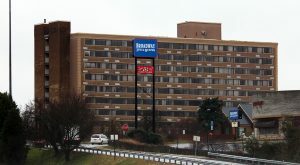 The project was approved in March 2016 and demolition came that fall. Rao praised the speed at which the tower went up. “I don’t remember any of our projects moving along so rapidly,” he said. 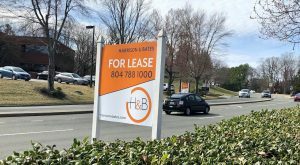 The project was jointly financed by VCU and Texas-based American Campus Communities, a development company that specializes in student housing. The 365,000-square-foot dorm is now the university’s largest, capable of housing 1,500 freshmen. The dorm’s main entrance is an archway preserved from a former public bathhouse that was on the site in the early 1900s. The dorm also features a 40,000-square-foot outdoor courtyard, and a gym, as well as lounges, kitchens and common areas on each floor. “This is why we attract the kind of students we do at VCU … In my time at JMU, I never lived in a building like this. I’m a tad bit envious and jealous of the students who live here,” Stoney said, laughing. 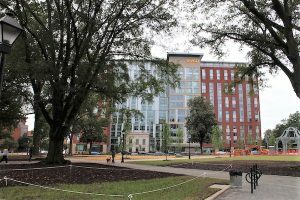 Across West Main Street from the new dorm, the centerpiece and namesake of VCU’s Monroe Park campus is now open after a nearly two-year, $7 million renovation. 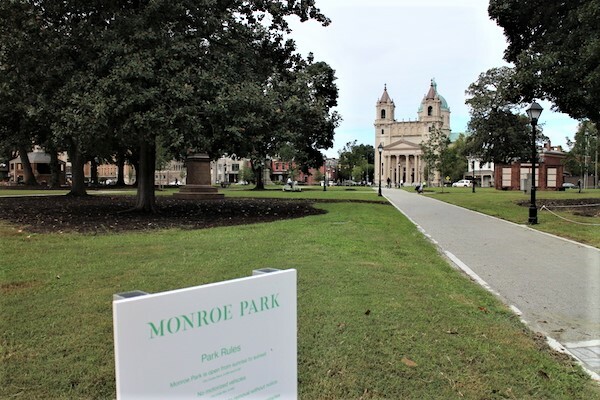 After nearly two years under construction, Monroe Park is open. The park originally was slated to open this summer, but was delayed due to 2018’s harsh winter and record rainfall. The renovation was the first major work done to the 7-acre park since its opening in 1851. The work included repaved paths, brick sidewalks, and new grass and trees, as well as tables and chairs, a bocce court and a restoration of a fountain in the park’s center. 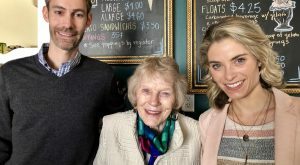 It also included conversion of the Checkers House – a small brick building adjacent to the fountain – into a police post for the Richmond and VCU Police Departments, as well as a coffee and smoothie cafe. 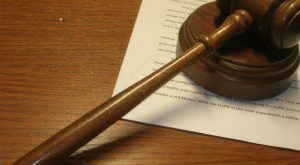 The city owns the land and leases it to the Monroe Park Conservancy, a local nonprofit.